Delicious Linguine Recipe! Even Self Professed “Non Cookers” Can Make This One! Think you can’t cook? Think again! I saw this on The Food Network and gave it a whirl. They were not kidding about UNDER 15 MINUTES TIL DINNER TIME! And that even the “non chef” can whip this puppy up! I substituted Quinoa pasta. You can use Brown rice pasta as well. Both are Gluten Free options! Also I tend to use water in my pan often in place of oil, but the option is yours! Check it out! 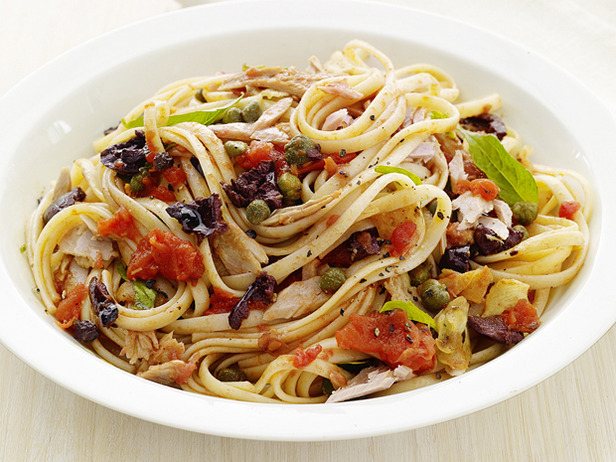 It’s Linguine with Tuna Puttanesca! It’s a great meal during a training weekend! And has a nice dollop of sodium to boot! Personally I love just about anything with kalamata olives! DELICIOUS!!!!!!!!!!!!! UNTIL NEXT TIME…..I ENCOURAGE HARD TRAINING and PROPER REST combined with SUPERB NUTRITION! Leave the competition in the dust …….